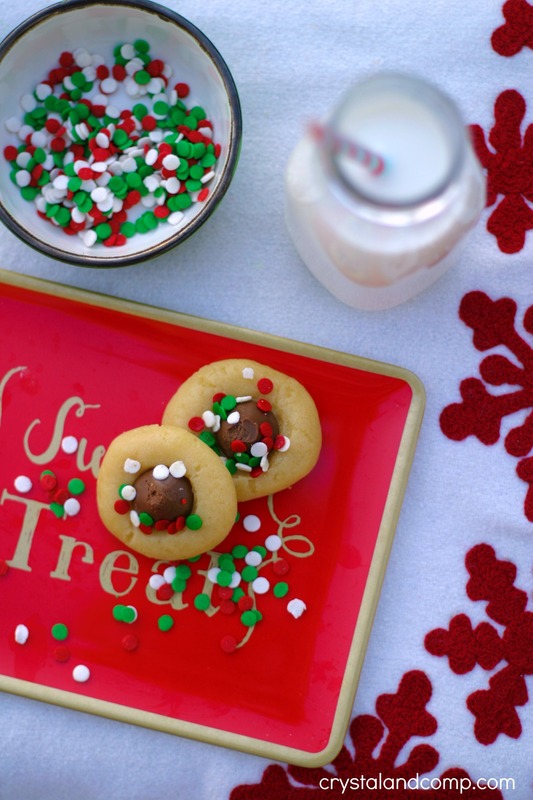 There is something about holiday thumbprint cookies that just shouts Christmas, if you ask me. These are perfect, and very easy, cookies that your kids can help you make. And they are so pretty too. 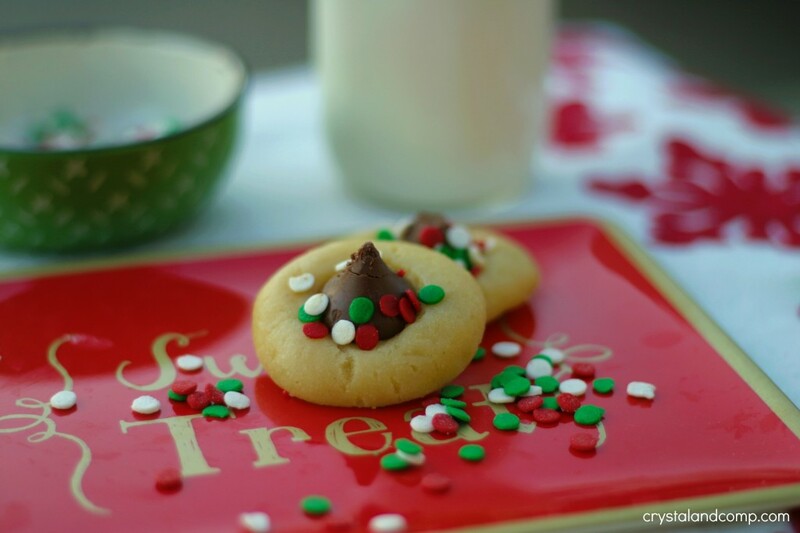 This recipe uses my easy sugar cookie recipe. With one batch of this stuff you can make so many things, like these thumbprint cookies. Grab a potion of the cookie dough. I use about a third of the dough for these cookies. I save the other two thirds and made cookie press cookies, cookie cutter cookies, etc. 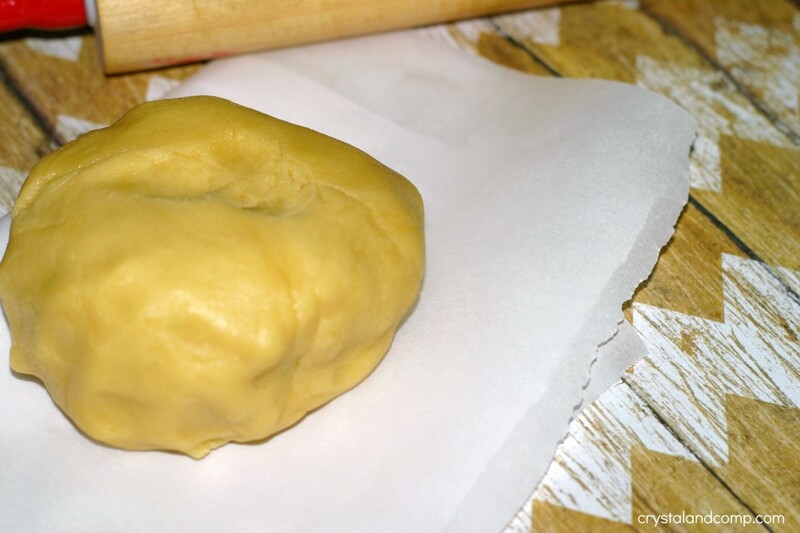 Make small balls by rolling the dough in between the palms of your hands. On a cookie sheet covered in parchment paper (for easy clean-up) space the balls out about an inch apart from one another. Use your thumb (or your child’s thumb) and press down in the center of the cookie. It will leave a thumbprint. Unwrap a chocolate kiss and place it in the thumbprint. Repeat this process for each cookie. Finally, sprinkle the top of each cookie with the confetti sprinkles. Pop the cookie sheet in an oven that is preheated to 350° for 8 minutes. When you remove them from the oven they may not look done. Leave them sitting on the cookie sheet while they cool. They will continue to cook just a bit while still on the sheet. Surprisingly, the chocolate kisses do not melt. The colors from the confetti sprinkles do not run either. Once cool, they are ready to be enjoyed! 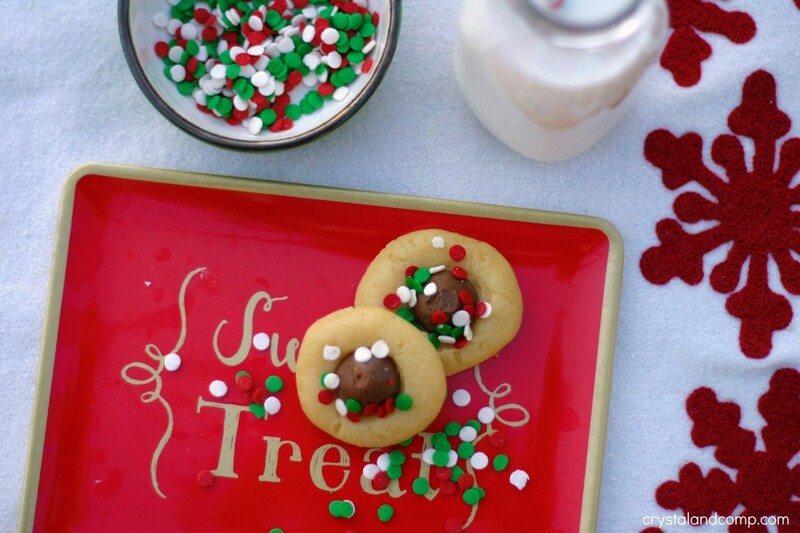 These are perfect on a plate for Santa! Or for the kids to eat. Someone bit the tops of these chocolate kisses once they cooled. Can you tell? These cookies go great with milk too! What a great idea! These look so easy to make and soooo delicious. These cookies will be a great seller at our church Christmas Bazaar I am sure! What a festive twist on an original recipe. They would be perfect to add to our holiday treats we make for our friends, family, and neighbors. Thanks for sharing. Have a blessed weekend!! You’re right – the kids would love helping with these! Those look like a great recipe for a party or leaving out for Santa. These cookies are so cute and festive! Thanks for linking up with What’s Cookin’ Wednesday! 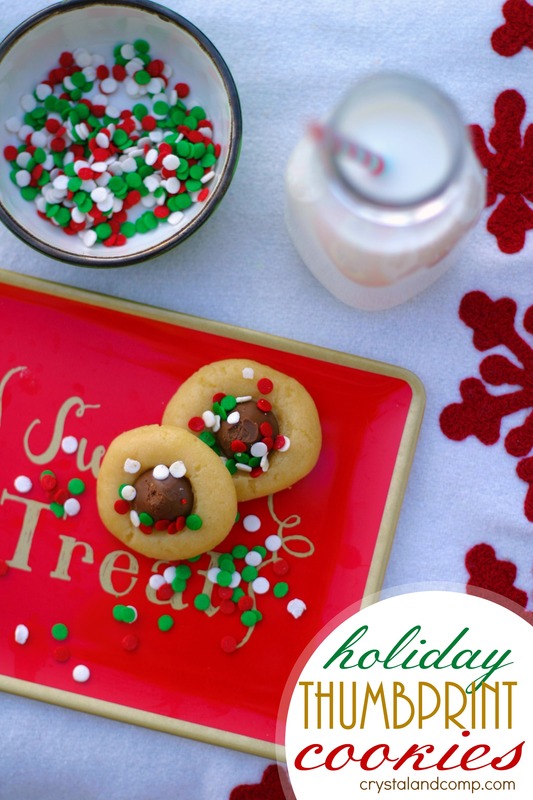 I love festive cookies that are easy! Thanks for sharing on the What’s for Dinner link up!